Daniel Sturridge came off the bench to score a brilliant equaliser and cancel out Eden Hazard’s strike in an exciting encounter between Chelsea and Liverpool at Stamford Bridge. Hazard picked up from where he left off against the same opponents midweek in the Carabao Cup to break the deadlock in the 25th minute – ending a move he started with a smart flick in the centre circle –and the Blues held on to their lead until the closing stages of the game. Sturridge also netted earlier in the week, and could find himself in with a chance of returning to the England squad if his early-season run of form continues. 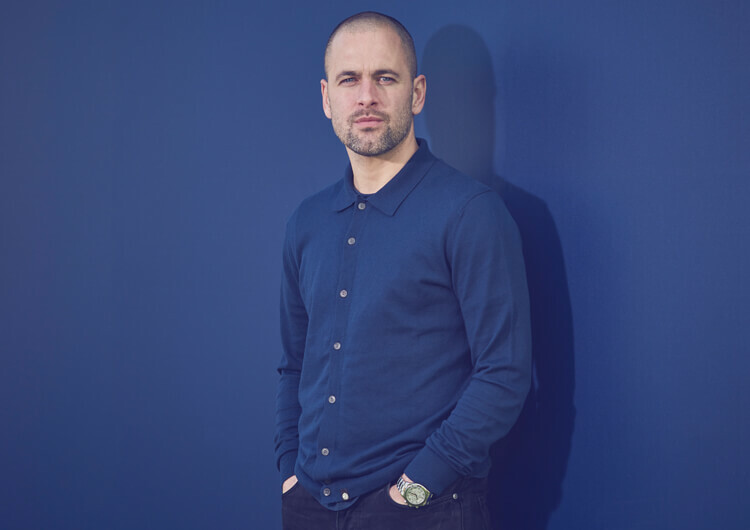 The striker casually sent an inch-perfect effort from 25 yards over the head of goalkeeper Kepa Arrizabalaga to earn his side a point when it seemed as though they were destined to suffer their first defeat of the Premier League campaign. The result means that Manchester City now sit top on goal difference, with Liverpool and Chelsea sitting second and third respectively after seven games. Chelsea set up in a 4-3-3 formation, with Jorginho, N’Golo Kante and Mateo Kovacic forming the midfield trio. Willian, Olivier Giroud and Eden Hazard led the attack. It was clear soon after kick-off that Hazard had been given the freedom to roam from his position and pick up the ball between the lines, where possible. 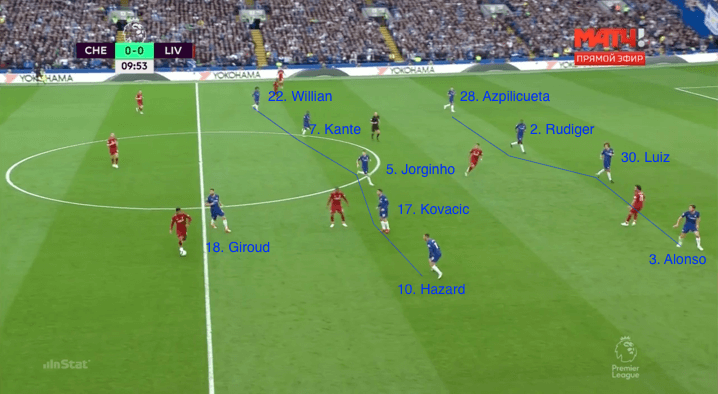 The hosts tried to build from the back, using centre-backs Antonio Rudiger and David Luiz to commit Liverpool players towards them and thus open up spaces behind to penetrate. A key strategy was playing the ball into the feet of a player who had dropped from a higher position before setting to a forward-facing teammate on a deeper line, allowing for penetration through the next unit. The player who set the ball would need to spin and run behind to collect the penetrative pass or the next set. Hazard’s involvement in this was crucial in the build-up to the game’s opening goal, which he himself eventually scored. Chelsea conceded possession for the majority of the second half after taking the lead, looking to keep Liverpool out rather than search for a second. They still tried to exploit the spaces to maintain a threat on the counter, though, and could have increased their lead with a more clinical performance. 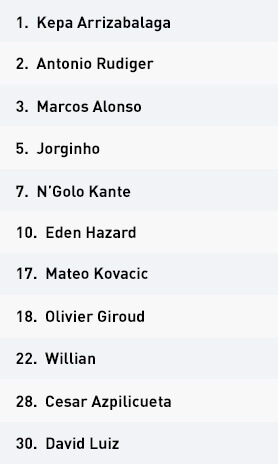 Maurizio Sarri’s players set up predominantly in a 4-5-1 system out of possession, with Hazard and Willian dropping from the front line to support Jorginho, Kante and Kovacic. 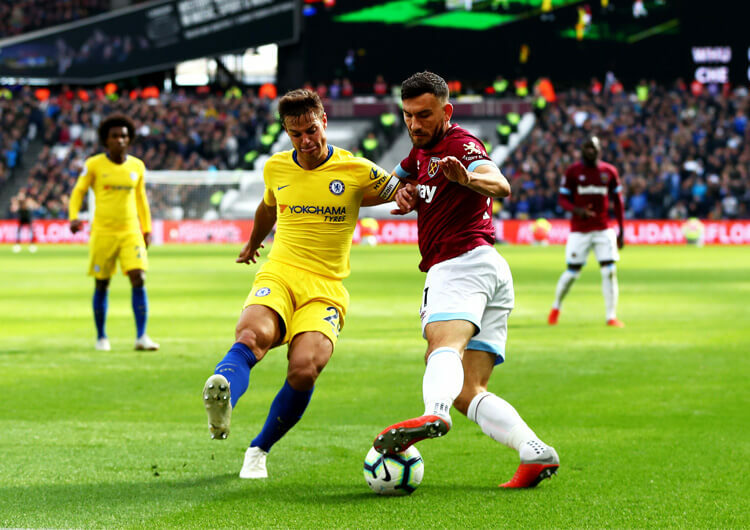 Kovacic and Kante covered large distances to close down their opponents’ centre-backs, but they would need to recover back if the visitors were successful in switching the play. This was a significant amount of work for the pair and consequently difficult to maintain for the entire encounter. 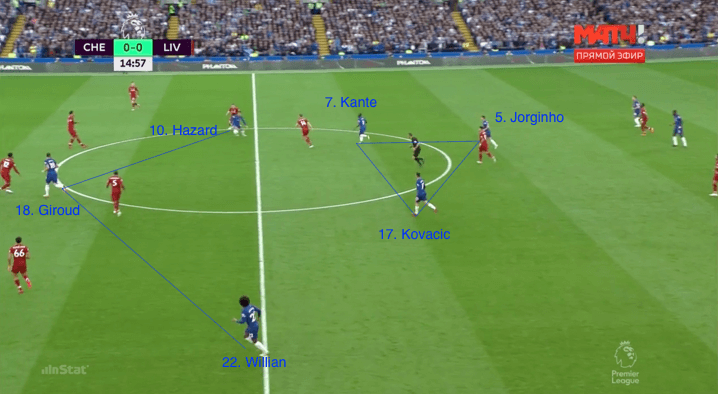 However, had wide attackers Hazard and Willian pressed instead of Kante and Kovacic, there would have been more distance for the midfield trio to cover across the width of the pitch, potentially opening lines for Liverpool into their full-backs, attacking midfielders and forwards. 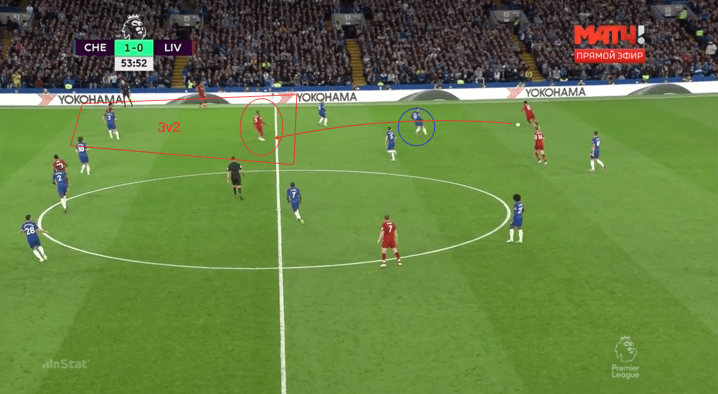 It was thus important that Hazard and Willian stayed slightly deeper to affect the Liverpool full-backs. The Blues occasionally switched to a 4-4-2 in the second half, leaving Hazard up top with Giroud (and, later, substitute Alvaro Morata). The two forwards could then press the centre-backs, enabling the four across midfield to cover more ground than a midfield three would have been able to. 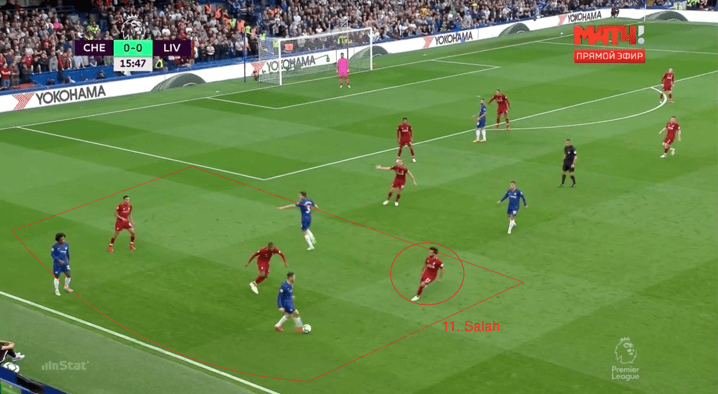 Gaps still appeared within this system, though, and Chelsea became more vulnerable to switches of play due to the enduring compactness of the four. Head coach Maurizio Sarri will have been frustrated to watch his team hold the lead for so long before conceding, but he will also take the positives from a performance that suggests his side shouldn’t be ruled out in the battle for the Premier League title. Chelsea set up in a 4-3-3 formation, with Eden Hazard, Olivier Giroud and Willian in attack. N’Golo Kante, Mateo Kovacic and Jorginho, in his familiar deeper role, formed the midfield trio. 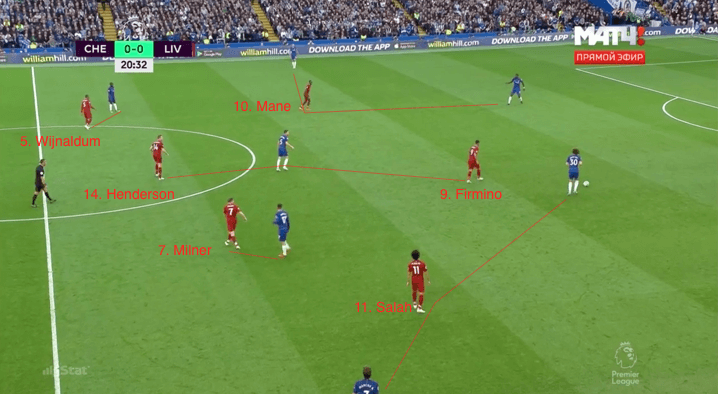 Chelsea operated predominantly in a 4-5-1 mid-block out of possession, with Hazard and Willian tucking in to make a midfield line of five and affect the Liverpool full-backs. Chelsea would drop players from the top line and look to play the ball into their feet between the opposition lines. Here, it is Hazard dropping to receive from Antonio Rudiger. 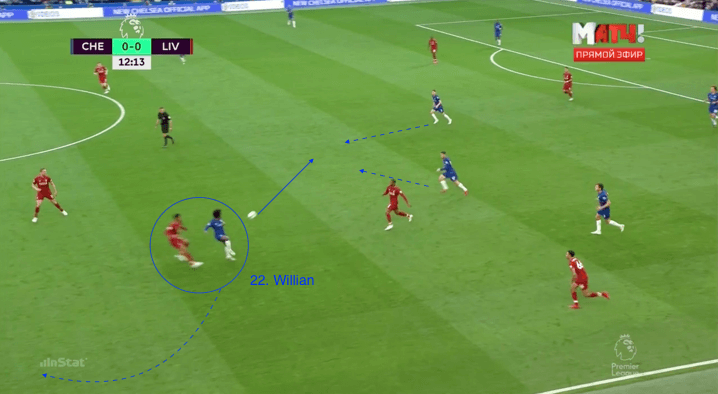 The player receiving to feet could then set to a forward-facing deeper player and spin off to receive a penetrative pass further on in the attack, as Willian does here. It was this kind of involvement from Eden Hazard that led to his opening goal on 25 minutes. Liverpool set up in their usual 4-3-3 formation, with Georginio Wijnaldum, Jordan Henderson and James Milner operating in midfield. Full-backs Trent Alexander-Arnold and Andy Robertson provided extra width in attack. 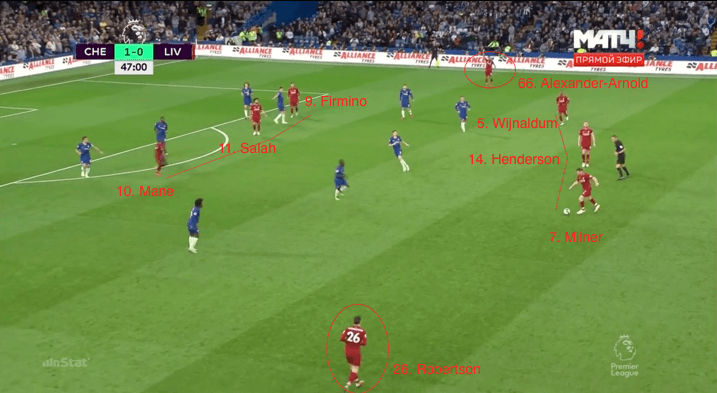 Liverpool pressed in a 4-3-3 and would tend to initiate a higher press only when the ball went into the Chelsea full-backs or deep-lying playmaker Jorginho. The Liverpool forwards often had to track back to assist with the defending – this reduced the possibility of an immediate counter. Liverpool tended to have to switch play when they did regain before being able to attack, as the vertical options were often limited. 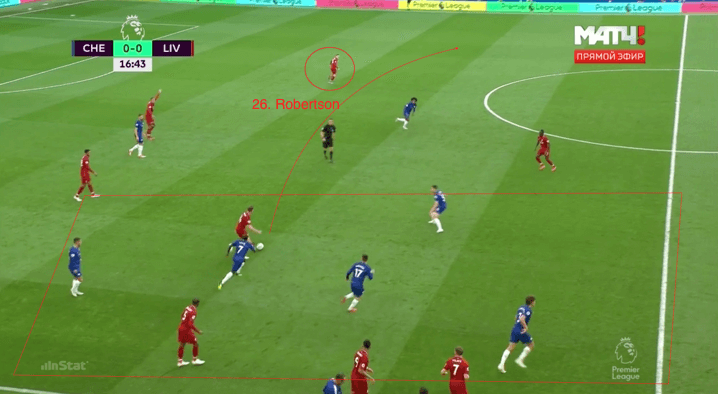 Liverpool tried to discourage passes into Jorginho, here blocked off by Roberto Firmino and marked by Henderson, when Chelsea built from the back. A man-oriented pressing approach limited the Italian’s options if he received the ball, and put him under immediate pressure. 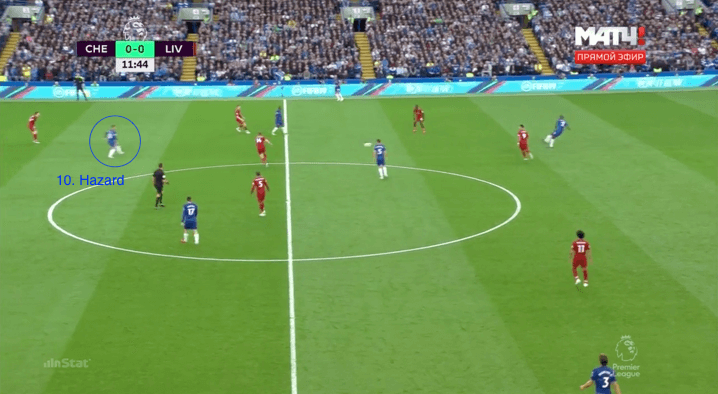 Liverpool tried to exploit the space behind Mateo Kovacic, who had to press over large distances, with Wijnaldum often positioned between the lines to help with this. 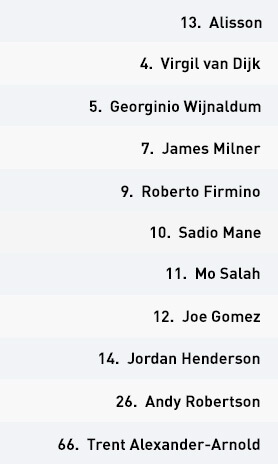 Liverpool set up in a 4-3-3 formation, with Jordan Henderson, James Milner and Georginio Wijnaldum operating as the three in midfield. Sadio Mane, Roberto Firmino and Mo Salah operated, as ever, as the attacking trio. In possession, the Reds targeted the left-hand side of Chelsea for the majority of the game. They looked to the quality of right-back Trent Alexander-Arnold and Salah to create opportunities down that flank, and capitalise on the inconsistency of Eden Hazard’s recovery runs. What’s more, midfielder Mateo Kovacic had to cover a significant amount of ground from this side to press centre-back Joe Gomez – this opened up spaces between the lines, for Wijnaldum to position himself where his team could remove the entire Chelsea midfield with one pass. 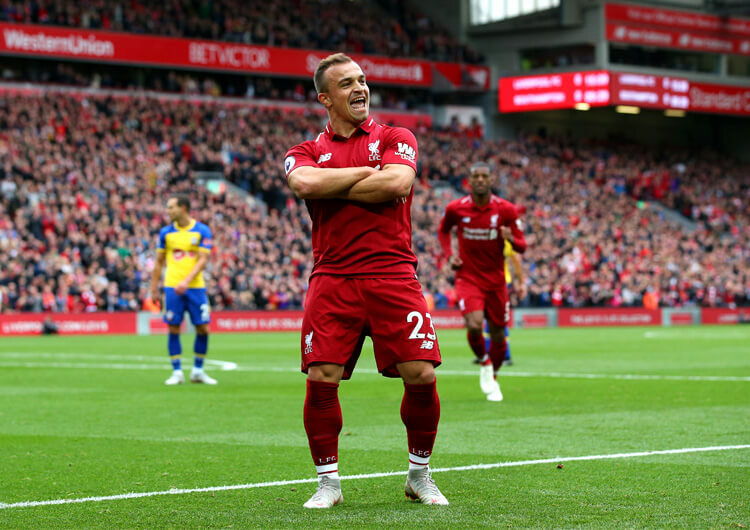 Liverpool favoured playing to the feet of their forwards rather than to the space in behind, as their opponents left little room for penetrative passes beyond their back line. The front three would move off the top line to create space to receive the ball to feet – this acted as the trigger for other players to run beyond for a potential pass around the corner, should a defender move with the player who had dropped. If a defender didn’t drop, the attacker could receive to feet and turn – Salah in particular enjoyed some success with this in the first half, but lacked the required end product. Jurgen Klopp’s substitutions in the second half saw Liverpool increase their running at the Chelsea defence. The switch of Naby Keita for Henderson was particularly effective, as a change in approach from their predictable horizontal passes now committed more of their opponents’ players and created opportunities for penetration through combination play and shots from distance – as seen for Daniel Sturridge’s equaliser in the final minute of normal time. 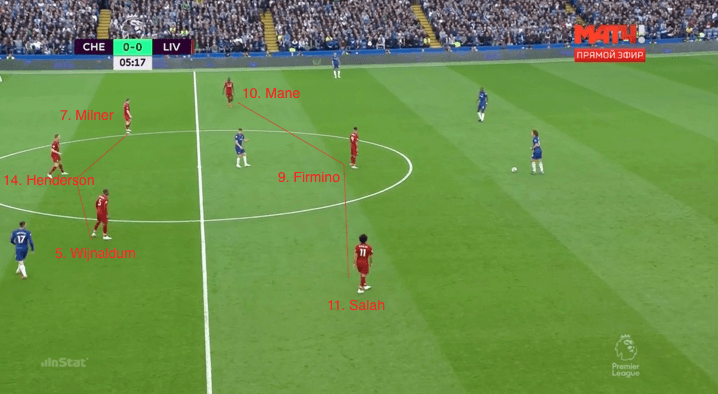 They remained in their 4-3-3 shape out of possession, but were often pulled into a 4-5-1 as a result of Salah and Mane having to track the Chelsea full-backs – a system that in turn reduced their counter-attacking threat. Instead of playing vertically, they then had to switch the play before initiating an attack. They tended to hold their shape until the ball went into a Chelsea full-back or Jorginho, at which point they would begin to press with intensity. The Reds tried to discourage passes into Jorginho when the hosts played out from the back, with a man-oriented press in place. Milner and Wijnaldum would pick up Kante and Kovacic; Salah and Mane would be half and half between full-back and centre-back; and Firmino would remain between Jorginho and the ball. Henderson would position himself five yards behind Jorginho, on hand to apply immediate pressure should a pass reach the Chelsea playmaker. The back line initially struggled with Chelsea’s vertical play and passes into feet before setting back. They became much wiser to their opponents’ approach as the game progressed, with Virgil van Dijk notably beginning to step in front of the player about to receive to feet and cutting off the attack. Liverpool did well to get back into the game, battling until the final minute to come away from Stamford Bridge with a more than deserved point. But Klopp will be hoping that his front three start to click soon, with Salah in particular enduring an uncomfortable afternoon of wasted chances against his former side.